It's beginning to smell a lot like Christmas, thanks in part to the stately live Christmas trees that have sprung up in many buildings and homes here. Christmas trees are usually species of the conifer - often the fir, spruce or pine. And their fresh, woody fragrance which humans so enjoy is actually a form of chemical defence, explains tree expert Shawn Lum. It comes from the tree's volatile compounds - primarily pinene and bornyl acetate, which belong to a group called terpenes. "These compounds are likely to be a chemical form of defence for the tree against insects and pathogens, but we enjoy the smell or, in some cases, the flavour; for example, in the Greek wines Retsina, where the resin of the Aleppo pine has been added," said Dr Lum, president of the Nature Society (Singapore). He said that because the trees come from temperate climes, they will feel most at home, and look their best in Singapore, with the help of air-conditioning. He also recommends cutting a centimetre off their trunks before placing them in water. This will help the tree "drink" water better by removing clogged water-conducting tissue, just as it is with flowers. Starting with the right tree is important: Inspect a potential buy by feeling the needles - they should be flexible, not dry and brittle. And make sure the tree smells good. If there is not much fragrance when the needles are flexed, it may mean the tree was cut too long ago. The fresher it is, the longer it will last. As soon as possible, get the tree into water. Mr Steve Quinn, director of Fresh, Cold Storage, said water should be added to the stand immediately after placing a tree, and that it may use up to 4 litres of water in the first 24 hours. Maintaining a high moisture level in the tree is the single most important factor in reducing needle loss and keeping the tree fresh, according to the Pennsylvania State University's College of Agricultural Sciences. Trees should be watered daily, and can last up to four weeks. 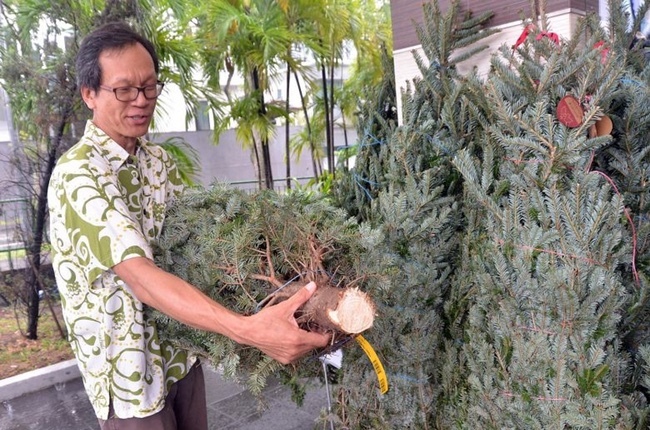 The species most commonly seen in Singapore is the fir: the noble fir native to the Pacific north-west of the United States, and the Fraser fir native to the south-eastern US, said Dr Lum, a senior lecturer at Nanyang Technological University's Asian School of the Environment. Although the trees produce oxygen when rooted in the earth, having live trees is not totally green, Dr Lum stressed, especially taking into account the energy and fuel used to import them. But they are more environmentally friendly, because a cycle of live trees would be able to absorb the carbon dioxide their plastic counterparts have contributed to. "Plastic trees have a higher carbon footprint as they are derived from oil and are not recyclable or biodegradable. In addition, incineration releases carbon dioxide from the burning plastic into the air," said Dr Lum. A live tree can be sustainably harvested, is biodegradable and can be recycled into life-saving mulch for other plants. A local alternative is the Cook pine (Araucaria columnaris), a coniferous tree that is commonly planted in Singapore and can be kept in pots, albeit without that characteristic Christmas tree smell. Despite the diversity of the conifer species, Dr Lum pointed out that 34 per cent of them worldwide are threatened with extinction, according to a 2013 assessment by the International Union for Conservation of Nature, due to factors like deforestation and climate change.Other cultivated trees for the Christmas trade are in short supply, given that they take years to grow. Mr Quinn said the supermarket chain went with the Fraser fir this year as "they retain their needles the longest and give off a fresh pine fragrance". Fraser firs are among the most popular Christmas trees. Their conical shape, needle retention and sturdy boughs make them ideal for keeping ornaments and tree parts off the floor. However, they take on average seven years to reach their marketable height. Mr Quinn explained that the 2008 US recession meant many Christmas tree growers could not afford to plant as much, while a drought in Oregon in the last five years had shrivelled up supply. Said Dr Lum: "A combination of changing climates, natural hazards and increased demand have created the perfect storm for the degradation of forests as well as shortage of Christmas trees." Making consumption of Christmas trees sustainable is essential to the longevity of the tree tradition, he said. So sustainably planting a few more seeds this year may be the ultimate Christmas gift for the conifer, he added.